NO air horns, Vuvuzelas, or whistles of any kind (teams using boom boxes for music must only play in between innings and/or for walk-up music). FNC Park reserves the right to turn off or remove any boom boxes for failing to comply. FNC Park does not provide onsite medical services. AED’s are located at each concession stand and the FNC Park office/shop. Specific events may have its own medical/sports trainer and will be generally located near the concession stand unless otherwise noted. If an emergency requires a 911 call, place the call. Be sure to state the location of the injury to your best ability. Once 911 has been called, inform an FNC Park staff member immediately about the emergency situation, so the onsite emergency plan can be activated. This includes, but not limited to, our staff properly directing emergency services vehicles and personnel to the location of the incident. What to do when the weather horn sounds? When the Thor Guard Lightning prediction system “SOUNDS THE WARNING HORN”, all recreation activities will stop. Participants and spectators should seek immediate shelter by returning to their cars. Game officials and or coaches will not supersede this policy. All individuals choosing to ignore this policy will be responsible for their own actions. Parents and any other individuals are encouraged to remind participants of this policy. Your action may save a life. A). 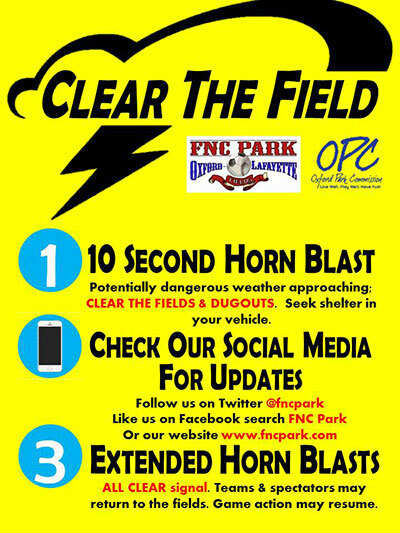 When lightning is within a 6 mile radius of FNC Park you will hear a loud 10 second horn blast indicating the need to clear the playing field and dugouts. Once the horn sounds, signaling a lightning strike in range, the referee/umpire will ask that you (the coach) clear your team from the field and dugouts. Spectators are strongly encouraged to return to their vehicles as this is the safest place to be during a thunderstorm. B). Once you receive this information or hear the sound of the horn we ask you gather your parents and players and instruct them to get into their vehicles and wait for the determination regarding the severity of the weather in the surrounding area. The wait will be no more than 20 minutes for an OPC Event. For a Tournament Event our staff will assess the playing surfaces and weather accordingly to make a decision on the status of the event. Please realize this is not an emergency situation! Thor Guard is an EARLY WARNING detection system that will detect lightning within a 6 mile radius of FNC Park. C). If the Thor Guard system continues to give its alert for 20 minutes or more, OPC events will cease and the participants will be notified by staff members as well as posting to our Twitter and Facebook feeds that games have been cancelled for the remainder of the night. If the system gives us an all clear within 20 minutes of the initial horn blast, staff members will notify participants signaling play can resume. For Tournament Events our staff will constantly update our Twitter and Facebook feeds with information regarding the status of the event. We are pleased to announce that FNC Park is equipped with the Thor Guard Integrated Lightning Prediction and Warning system. Thor Guard is a highly sophisticated sensor and computer that measures and analyzes the electrostatic field in the atmosphere. Lightning originated within this field allows Thor Guard to make calculations predicting its occurrence. Thor Guard is being used by the United States Golf Association, LPGA, PGA tour, Nike Tour, ABC TV sports and was used in the Atlanta Summer Olympics. It is also used by several recreational facilities throughout the USA. How effective is Thor Guard? Thor Guard predicts the probability of lightning hazard in an area up to 25 square miles. It provides a specific reading of the risk in your immediate area. How do you know when it is working? Thor Guard is equipped with an interactive horn warning system. The first horn gives those outdoors the opportunity to seek shelter. After the horn sounds a flashing yellow strobe light (location on top of the FNC Park shop and the Soccer Concession Stand) will blink continuously until 3 loud horn blast sounding an all clear and play can resume shortly after. In 2018 FNC Park added 5 walking bridges and approximately 170 additional parking spots to better serve our patrons using the soccer fields.